The recently introduced Qualatex® taper foil balloons offer unique decorating options for events throughout the year. Shown below are Starburst sculptures, each created by connecting twelve (more or less) 38in tapers. Each Starburst measures five feet in diameter. 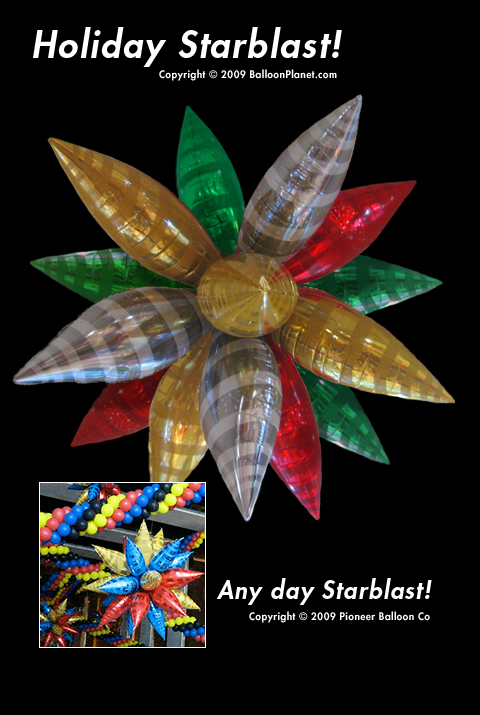 In the USA, professional installers typically charge $150 for a 12-balloon Starburst, plus a 20% installation fee. The 38in taper balloon can be air-filled for extended displays, or helium-filled for events lasting less than a few days. Smaller taper balloons are available in 13in and 27in lengths and are intended to be air-filled, then suspended. Contact your local distributor for color and size availability. Our first video on YouTube! A video on three simply techniques for curling 260Q balloons. Welcome to The Balloon Planetarium – a blog for BalloonPlanet.com partners and customers. Check here regularly for insights into balloon culture, balloon product updates, network and industry news, creative tips, and policy updates. Visit BalloonPlanet.com's profile on Pinterest. BOO! Your 2018 Halloween Balloons Are Here! aimee on Lots and lots of Big Dots! Proudly powered by WordPress Theme: Kirumo.